Last year (in October) I attended the Creative Stitches trade show, and this year I attended the show once more in September. I would have written about it sooner but I had a number of posts lined up… and I needed a bit of time to think about the show too. Last year I was concerned that the show was going downhill, and this year that thought continued. 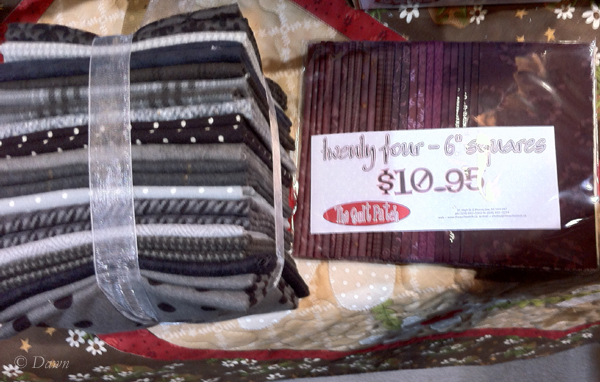 It appeared that there were far fewer vendors than usual, and some of the ones I really look for (A Great Notion Sewing Supply out of Surrey and Abbotsford, along with Gala Fabrics from Victoria, Vancouver and Hong Kong) weren’t there this year. A few others that I like (The Sugar Pine company out of the nearby Canmore and Steam Trunk Craft Works out of Surrey, BC) were there, but neither had anything I was looking for this time around – especially since I still have things to sew and craft-up from the show last year! 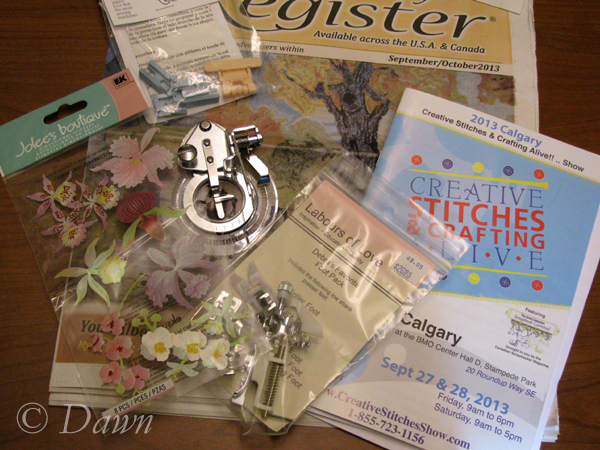 As I mentioned in a previous post, I attended this year’s Creative Stitches & Crafting Alive! trade show – and I’ve already discussed some other elements of the show, but there were a few other photos I didn’t have a chance to share, that I thought I’d toss up for inspirations sake. 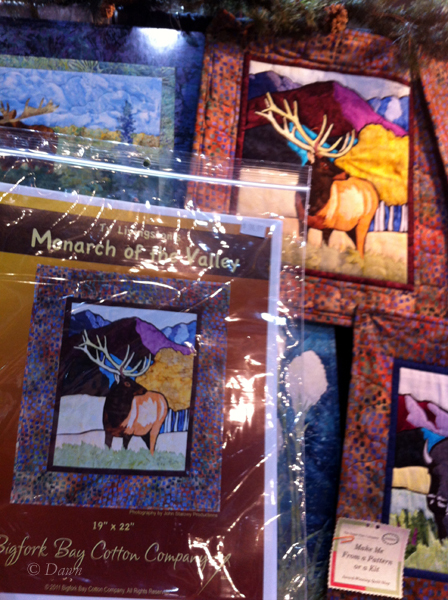 This one is called Monarch of the Valley, and it is of an elk – they also had a bear, a buffalo, and another elk as well. (Click here for a shop selling this pattern – no recommendation intended – just one I found online since the Sugar Pine Co. didn’t seem to have it on theirs.) I liked this mostly because of the black outlines around the element – I am guessing that several of the pattern pieces is cut out of black and then the fabric – with then the fabric cut slightly narrower – so that when layered on top of the black, an outline of black shows around each of those selected elements. In Carola’s class on texture, she also brought out starfish, and the example below. Time was running short when we were in the workshop, so I didn’t get the chance to see it up close, but instead saw it in her booth later on. 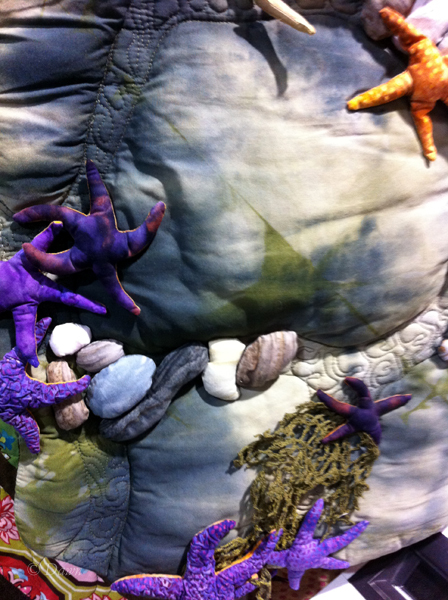 The starfish were each sewn, slashed and stuffed, the quilting was done on “ugly” (her words) hand-dyed fabric resembling mucky water along the shoreline, and turned-and-stuffed pebbles as well. The seaweed in this piece was made the same way she made the moss in the texture example art quilt that we spent the most time on in the workshop itself. (By stitching with quilt-weight thread on several layers of wash-away stabilizer in a repeated pattern to build up the thread before washing out the stabilizer and then attaching the ‘seaweed’. 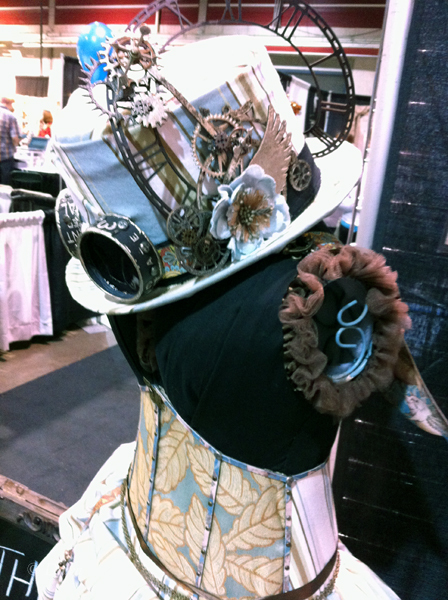 In the scrapbook area, there was a shop booth that had this awesome steampunk mannequin – made almost entirely from paper-crafting supplies! 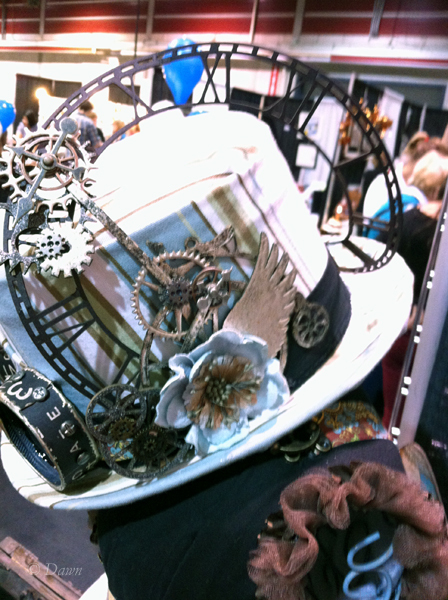 The outfit included a corset and bustle skirt, but what I really liked was the hat! Decorated with gears, flowers, and goggle,s what I really loved about the hat was the huge scrapbook chipboard ‘clock’. … and then also found the clock too. Such a cool idea I’d love to try to replicate it – but… eh. I didn’t bother picking this up, again trying to show some restraint in the new-project-file. I have so many projects on the go – including hats… that I didn’t want to add this – especially since the chipwood would restrict the wearing of the hat – being paper and all. 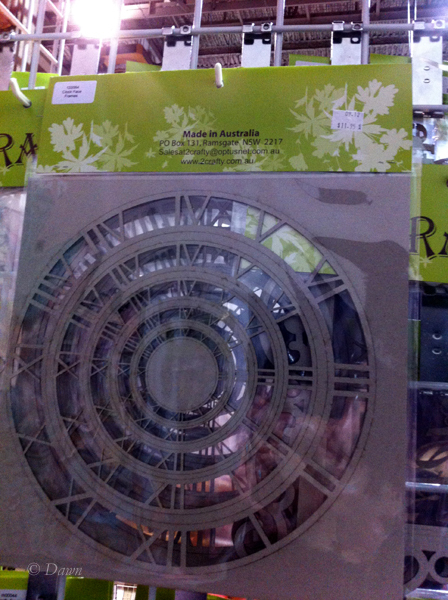 Plus, I think I know where I can get the chipboard clock faces (or the cogs if I wanted to go that way instead…) if I decide to attempt to do something similar in the future. So… feeling inspired means I should have some completed projects to post at some time.. right? 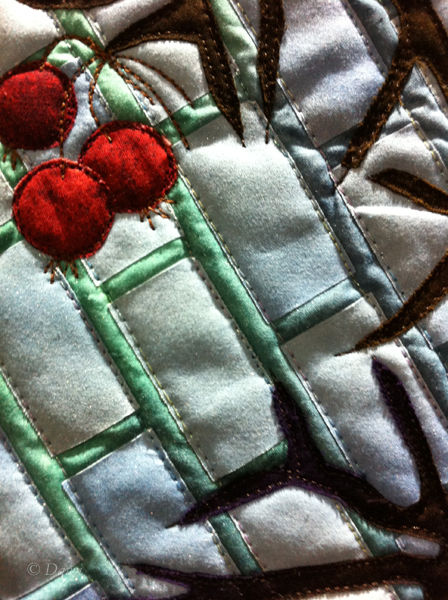 So earlier I wrote about the Creative Stitches & Crafting Alive! trade show in mid/late October and some general thoughts. I then showed off some of the examples from one of the workshops I attended. I didn’t mention that there were also two displays at the show of completed quilts in a sort of competition/exhibition. One was all full-sized quilts (with a theme of patriotism or military or Canadiana I’m not sure exactly…) and I’ll admit that I wasn’t especially inspired by them, so I didn’t take any photos. The other was more of an art-inspired, textile exhibition. I found some of them really nice, and took a few photos. 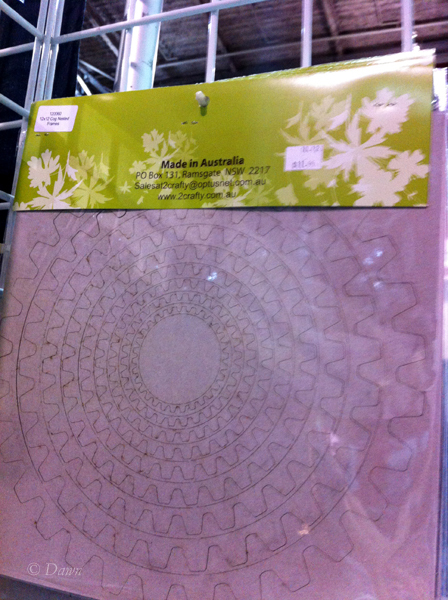 Like the Sunflower quilt that Carola showed us – this one was most likely made by discharge (bleach). 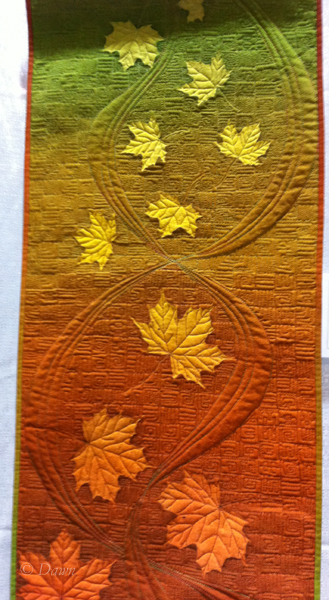 I think that the artist/quilter started off by custom-dying the background fabric in the gradation from green to yellow to orange to rust, and then used a stamp or something to bleach out a few leaves “falling” down to the ground. Notable is that the leaves do vary in size, but the largest leaves are near the bottom while the smaller ones are towards the top. This gives the impression of distance. The boldest quilting seems to be a wind blowing down, while the background filler quilting is geometric. 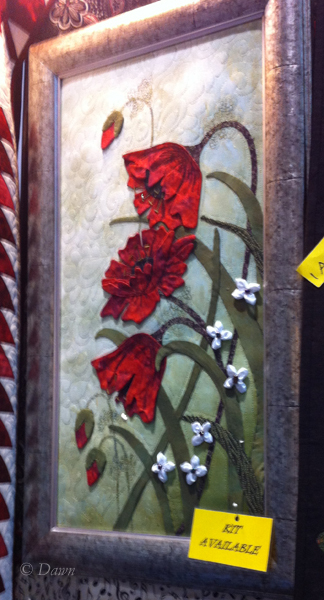 This quilt is called “Blown into my yard III” and is by Margie Davidson from Edmonton, Alberta. 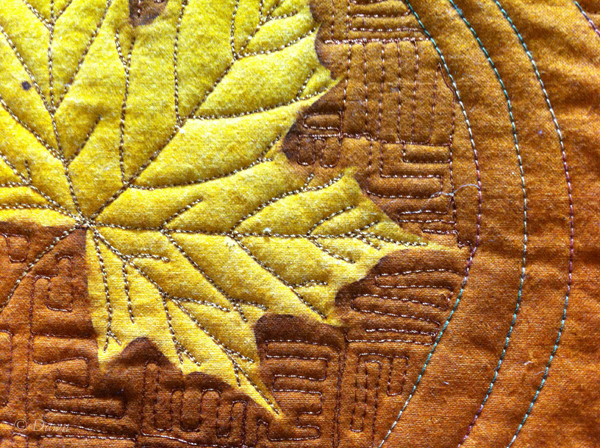 The next quilt is called Crows and Crabapples and is by Emilie Belak from Grand Forks, BC. I like the imagery of the crows, and the bright pops of red along with the dark brown branches and dark birds is very bold against the varied blues of the background. I really like the background itself too – it looks so subtle from a distance, but up close you can see that it is loads of little rectangles all lined up and appliqued (fused) and stitched down to the background to create one layer of quilting on top of which the applique is added. 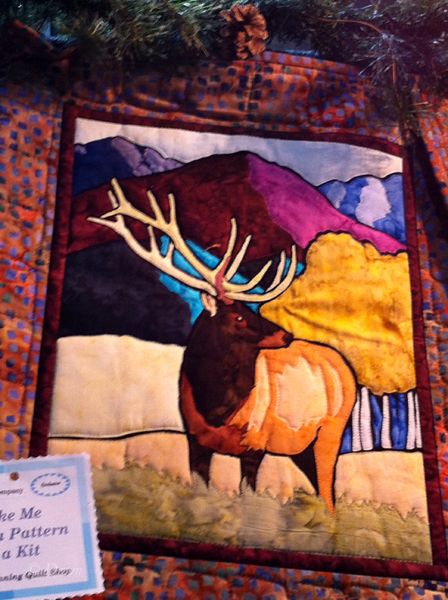 The next quilt I really like, but can’t even imagine reproducing in any way – it is called “Kanaka Creek Sunset” and it is by Vivian Kapusta from Maple Ridge in BC. With the lighting in the room I wasn’t able to get as good of a shot of this as I would have liked to really represent what it looked like. Basically it seemed as though the quilt was as much a quilt as it was painting with thread. The sunset in particular was really well done (and really blown out in the photo so you can’t really see it at all… ) with all of the yellow threads coming from the ‘sun’ in the centre. Looking at the details- it also looked like the fabric was more dyed and painted than pieced, which was kind of cool, and an interesting way to reproduce the image. The final quilt that I really liked and took a photo of (there were many more quilts than just this, but only a few that I really liked) is called Too Far Away by Pat Findlay from Winnipeg, Manitoba. The exhibition was put on by the Fiber Art Network of Western Canada, and represented artists/quilters from Manitoba, Alberta, Saskatchewan, British Columbia, Yukon and the Northwest Territories. 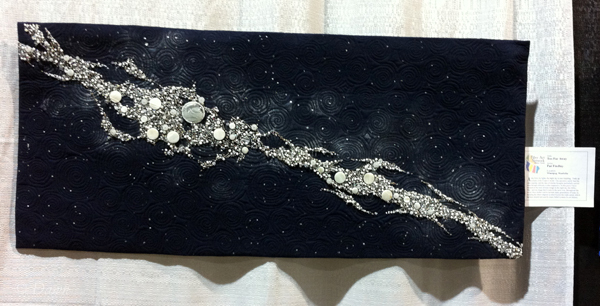 The triple spiral is used in the background quilting of the piece, and in addition to beading the piece extensively (I would suggest that the beading is creating the “art” of the piece much more so than the quilting…) the artist also used silver paint to expand the “milky way’ around from just the beads. The eye is really drawn to the one very large glass piece which is not a bead I suppose – as it is sort of couched onto the quilt with silver threads, and framed in small white beads (possibly hiding the base of the silver threads?) 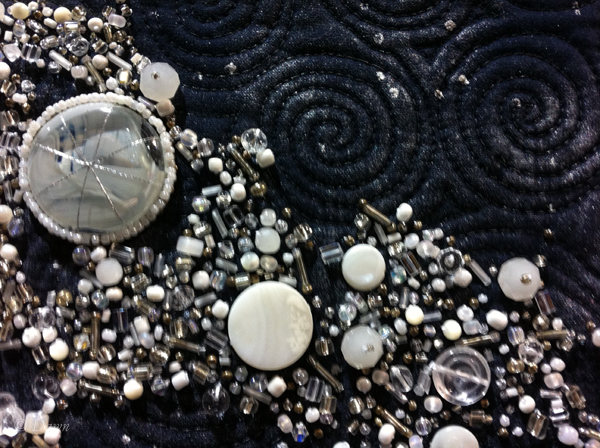 Some of the larger white circles might also be buttons instead of beads, since they seem to be flat. This is actually something that I think would be a lot of fun to try to reproduce. It sure would be fun to collect all of the beads!